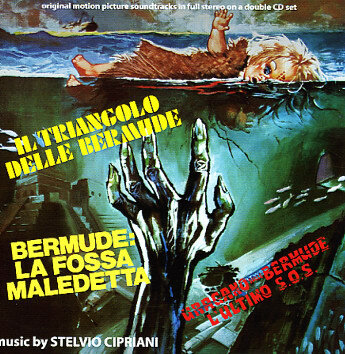 The 136th Soundtrack of the Week is this CD of Stelvio Cipriani's music for three Bermuda Triangle movies: Il triangolo delle Bermude, Bermude: La fossa maledetta and Uragano … Bermude l'ultimo S.O.S. I found the first of these movies at the Brooklyn Public Library and fell asleep trying to watch it. It's pretty bad, definitely a low point in the career of John Huston, who plays a diver looking for a lost city under the sea. The CD has only two tracks of music from that one, rather sombre, moody music. The first one is in 6/8 and has a processional feeling. The second one is all long tones on strings. You hear these two cues a lot in the movie. "Magic Dawn", the first track from Bermude: La fossa maledetta is a laid back disco groove with conga and the kind of electonic keyboard sounds that immediately suggest Italian genre flicks from the '70s. The electronic keyboards really take over for "Missione Subacquea" whie "Sail Boats" is kind of a cheesy cue that sounds like a love theme. You hear several different versions of it, including one with vocals that makes it sound a bit like The Beach Boys—not because of vocal harmonies but because of the shape of the melody. "Incubo Nei Profundo" is genuinely creepy with moaning wordless vocals on top of a suspenseful atmosphere created by the string section. "Forze Oscure" is dramatic/suspenseful underscore that you hear in a few different versions. "Magic Dawn (versione 2)" runs through that tune again but with greater emphasis on the rhythm section. "Don't Answer the Phone" is "Magic Dawn" with rhythm guitar. "Magic Dawn (versione 3)" is the slow version. "Bermude Dance" is straight-up but stripped-down disco. "Don't Tamper With My Things" is kind of a disco/funk/prog freak out. "Storm in a Teacup" is a variation of this cue. "Angelica" is true to its name, a "heavenly" cue for strings. Uragano … Bermude l'ultimo S.O.S. begins cautiously with "L'avventura inizia", a restrained orchestral cue that suggests the remembrance of past voyages. "Terrore marino" lays on the dread in a way that Angelo Badalamenti might admire. "Bermudas bossa" is a fairly cheesy bossa-like tune . "Abisso di morte" is more dread and "Amore sulla spiaggia" sounds like a love theme. "La grande avventura" returns to the mood of the main title before adding fear-inducing strings and percussion. "L'ultimo SOS" is more scary music with electronics and percussion very effectively creating a creepy, underwater atmosphere. "Bermudas disco" is a disco number, as you might expect. "Incontro con gli umanoidi"is more dread and fright. "Strane luci"is the most ominous piece of music on the CD, with a low rumbling drone and a gloomy descending line for the strings. 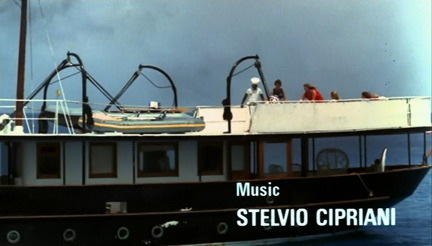 "L'avventura continua" returns to the feeling of the main title and then there's a "Bermudas bossa reprise". 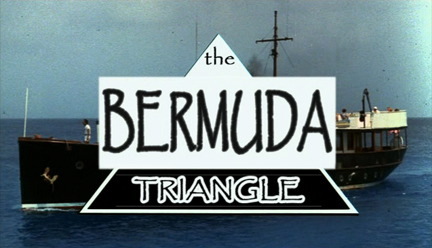 "Verso l'orizzonte" is a reprise of the main title from the first of these Bermuda Triangle movies while "Festa al mare" presents strummed steel-string guitar combined with an ebullient electric bass line and a ridiculously buoyant electric paino sound. "Scoperta inquietante" returns to the wonderful weirdness of "L'ultimo SOS" and "Fine dell'avventura", the final track, returns to the mood of the main title music.